Since e-commerce business requires a lot of efforts right from the earliest stage, it becomes imperative on your part to work towards managing customers, serving their needs, addressing their problems, and putting them in a comfort zone. You, therefore, need to channelize your time and energy towards planning and managing the effective strategies in order to get an edge over your competitors. The use of smartphones to access internet is increasing day by day. This has significantly changed the dynamics of ecommerce industry. The year 2017 will only add to this rising trend of smartphone users going online. It is often seen that many ecommerce websites are not compatible for smartphones and tablets. If you want to make your business thrive in this competitive age, make sure that your site can also be viewed on a mobile phone. For that to happen, you must create your website with responsive web design that allows your website to automatically adjust and fit to the screens of smartphones, tablets, and other portable devices. It is now a stated fact that responsive design sites receive an 11% increase in visitor-to-buyer conversion rates. To make it highly responsive, you can use interactive extensions and plugins and integrate them while developing your website. To put it simply, the search engine optimization is one of the most important tools for the success of any ecommerce business. The more you optimize your site, the better are your chances to rank high in search results, which means more traffic to your website and ultimately more sales for your business. You can start by optimizing the architecture of your e-commerce site. The better architecture of a site allows the users an easier navigation, helps the search engines better indexing in helping rank your site better. The next step to follow is to conduct on-page optimization to increase conversion of your ecommerce website. On-Page SEO enhances the elements that make up your website. It helps the search engines in properly identifying different parts of the results page. Finally, it is also important to optimize your keywords, links, social media features, and overall content of your website. Your SEO will still remain incomplete if you do not factor in the optimization in YouTube. YouTube is arguably the most popular video sharing website today, so you shouldn’t let go of any opportunity to promote your business in this platform. You need to incorporate important expressions and keywords into the titles of YouTube videos. Use tags to lure the users who are watching videos by properly placing links within the videos. A well written, engaging and original content being put in an ecommerce website is a definite boon for its business. It will make no sense if you have fully optimized your site but didn’t create good quality and original content. The efficacy of good content is based on its ability to resonate with your customers in a way that force them to interact with you and finally purchase your products. The creativity plays an important role in developing high-quality content. Remember content is not limited to just words and texts (though they are very important), it also includes visual images and audio/video. You can, therefore, use many photo-editing tools to create visual content, audio, and video to promote your product. The impressive imagery of your website can have a lasting impact in the minds of your visitors. Marketing the original content is the next logical step that you need to take. It makes sure that your audience is receiving new and relevant information that could help them in many ways. The important aspect of your website’s content is its virtue of being informative because according to Pareto’s 80/20 principle, 80% of your content should be informational, while 20% should be promotional. The subscription-based business model is on the rise. It provides flexibility to businesses as well as consumers, which is a win-win situation for both the parties. In terms of revenues, businesses are increasingly benefiting from platform as a service trend. 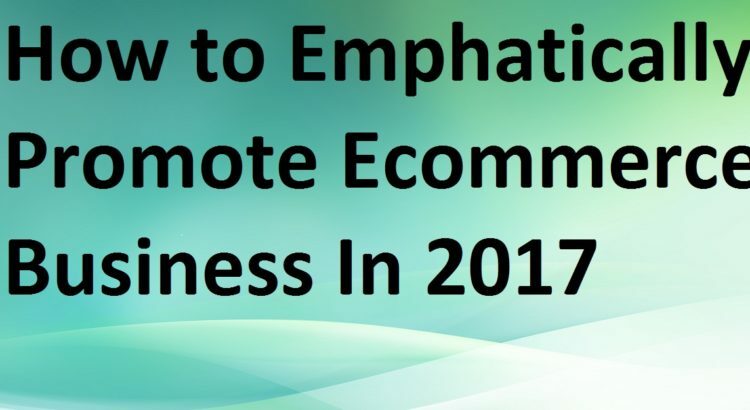 The year 2017 will see ecommerce companies providing their products on a subscription basis. They are now keen to spread costs using subscriptions rather than a single ticket purchase. The subscription model is proving to be so effective that anything that is consumed regularly could successfully be sold via subscription-based business model. It is a proven fact that customers who once showed interest in your website are more likely to make a purchase sooner or later. You shouldn’t lose sight of such customers and re-target them to promote your business. It is basically a technique that is used in tracking those customers who had earlier visited your website by displaying your products’ ads to them while they are browsing the internet. In order to get those customers back, you need to effectively manage the re-targeting campaign by ensuring that your ads are as specific as possible. It is the relevant display information that makes the user to instantly click on your ad so that they land on the product page they are looking for. E-commerce is a rapidly growing field of business that is attracting competition with each passing day. Thousands of entrepreneurs are entering in this field with new and innovative ideas. But to become successful, you need to respond quickly to the latest trends and strategies. The above mentioned tactics are going to be even more profoundly followed in 2017 by the businesses to attract more and more customers to the websites.